Setting of Cement - Process, Tests, & Time. 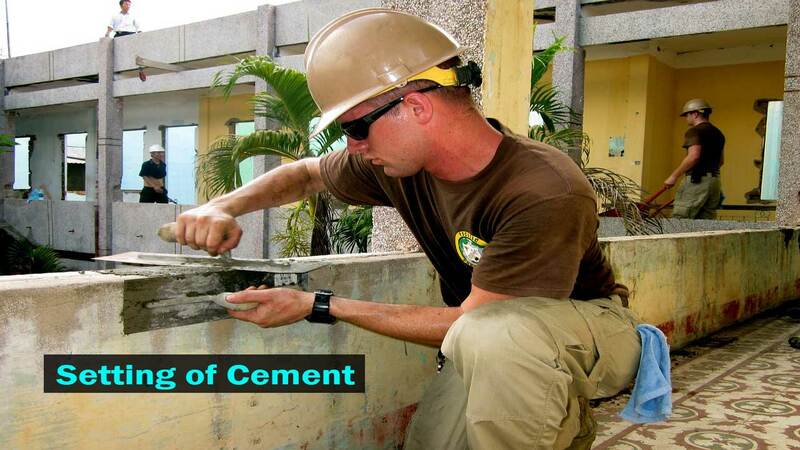 Setting of Cement – Process, Tests, & Time. Test for Setting Time of Cement. By setting of cement, it is understood that conversion of a plastic paste of cement and water to a non-plastic and rigid mass. This change from a plastic mass to a non-plastic mass may take any time between few minutes to an hour or more. It is the first stage and starts Immediately after addition of water. In this process the four compounds of cement (C3S, C2S, 3CA1, 4CAFe) get hydrated. The first compound also undergoes hydrolysis. As a result complex hydro silicates are formed. In this stage, the intricate system of hydro silicate crystals formed as above separates out in the form of a gel which gets gradually thickened and acts as glue around other particles. Thereby initiating the setting of the cement. During this stage, the mortar (cement-water-sand paste) becomes fully saturated and can take no more water. In this stage, most of the components get transformed from a gel or colloidal state to crystalline state. The least stable colloids of tri-calcium hydro aluminate and calcium hydroxide are first to pass into a stable crystal phase. Calcium hydro silicate gel also hardens almost simultaneously. This nearly simultaneous development of crystals and hardening of gel results into a strong and inter-grown mass of crystals and gels. Hardening of cement is different than the setting of cement. It may be defined as the capacity of the set cement to withstand loads without disintegrating or cracking. Thus whereas cement may require only a few minutes and hours to set, it may become sufficiently hard only after a considerable time, measured in days, weeks, months and even in years. Some cement set quickly, within a few minutes whereas others may take comparatively longer time. Moreover, the setting is not an abrupt process which may complete immediately after its start; it is rather a progressive phenomenon, which has a beginning, full development, and an end. It is, on this latter basis, the setting of cement is distinguished into an initial and final setting, qualified by the time required in each case. (i) Temperature at which cement paste is allowed to set; very cold temperatures retard the time of setting. (ii) Percentage of water mixed to the cement (water-cement ratio) in making the paste; it must be the right quantity for complete hydration and crystal formation. Less water will result in incomplete hydration; extra-quantity will bleed out after the cement is set. (iii) The humidity of the atmosphere in which setting is allowed to take place. It acts through temperature and moisture conditions. It is, therefore, essential that all the mists for setting time of cement are performed at Standard conditions of temperature and humidity and on cement pastes of known consistency. Read More: Curing of Concrete – Its Methods, Time, & Requirements. The Indian Bureau of Standards has specified the use of Vicat Needle for the testing setting time of cement. (i) It consists of a frame with a movable rod with a cup. (ii) A needle of 1 mm sq. cross-section is attached to the lower end of the rod for determination of the initial setting time of cement only. The total weight of the rod along with the needle is 300 gm. (iii) Another needle like the above, but with hollow metallic attachment with a circular cutting edge of 5 mm in diameter and having 0.5 mm projecting end of the needle. It is attached to the lower end of the rod when the final setting time of cement is to be determined. (iv) A standard Vicat Mold in which the test specimen is allowed to set. From the sample of the cement to be tested, test specimens are prepared in the following manner. (i) Take 300 gm of cement. Form a paste by mixing 0.85 P water (where P denotes the percentage of water required to make a paste of normal consistency). Note the time when the water is added to the cement with the help of a stop watch. Let it be “T2”. (ii) Fill the Vicat Mold completely with the paste so prepared under the standard conditions of temperature and humidity, (27 < 2 centigrade and at least 90% relative humidity). Fix the specified needle (for the initial setting time of cement) with the rod. Place the mold with the test specimen under the rod and lower the rod gently till it comes into contact with the block. And then quickly release the rod. Note the depth to which the needle penetrates the paste. Repeat the experiment (of releasing the rod) till the depth of penetration is 35 mm above the base of the mold. This means, the needle penetrates up to 35 mm and cannot penetrate the last 5 mm at the base of the mold. When this happens. Note the time once again. Let it be “T1”. The time that has elapsed between “T1″ and “T2″ is the initial setting time for that sample of the cement. Read More: Types of Rocks | Classification of Rocks. The needle with a circular cutting edge is used for this purpose. It is attached to the rod. Using the same sample that has been used for finding the initial setting time, the rod with this needle is released again and again after bringing in contact with the paste in the mold. Initially, the needle along with the cutting edge may pierce in the paste but a time would come when it fails to pierce at all. The time is noted when the needle fails to penetrate the specimen but only makes a slight impression (and the Cutting edge does not even make that impression). Let this time be “T3”. Then the time that has elapsed from T1 to T3 is the FINAL SETTING TIME OF CEMENT. By this time the entire paste is fully set in the mold. Ordinary Cement It shall not be less than 30 minutes. It shall not be more than 10 hours. Rapid Hardening Cement It shall not be less than 30 minutes. It shall not be more than 10 hours. Low Heat Cement It shall not be less than 60 minutes. It shall not be more than 10 hours. Read Also: Soundness of Cement & Its Test by Le Chatelier Apparatus.